GReddy exclusively uses GReddy Spec. Mitsubishi Heavy Industries, Japan Turbochargers, many of which are unique to us, including the popular 18G’s, compact TZ line and large hybrid T-power Turbos. It is well known, Mitsubishi turbochargers are among the highest quality turbos in the industry today. They utilize a durable center cartage, an extra large free-floating bushing with a large diameter center shaft. We believe this design to be superior to all other standard bushing turbos as well as many ball bearing types. Through testing we have found that some of these Mitsubishi turbos have better response than similar sized ball bearing competitors in certain applications. The most important key is how well matched the turbocharger is for your application or how well designed a turbo kit is for the end goal. Peak horsepower numbers, large external dimensions and max boost levels are not the only important factors. Variations in properly sized housings and wheels can mean all the difference in drivable, usable power. 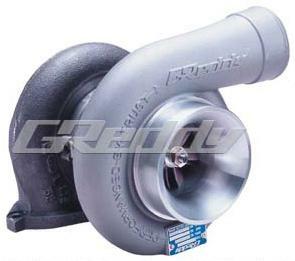 With well over 20 years of performance turbocharger experience, GReddy is able to offer an ideal combination of response and peak power by properly matching the turbocharger size and design to suit its desired application. From high power, top level race cars to our popular bolt-on and upgrade turbo kit lines, the GReddy Turbocharger line can provide a best match for just about any application. Specifically for Bolt-on Kits, we generally build kits around turbochargers at their lower end of their efficiency range, so although they have good bolt-on performance, the kits are still highly upgradable for higher boost applications. By utilizing oil only center cartridges, installation is simplified without affecting reliability as long as proper turbo timing and oil is used and regularly changed. This turbo design also helps in the engine’s reliability by not taxing the engine’s coolant system. With sizes varying from the smaller TF035 and TD04 families up to the 1000+hp capable T88H, GReddy turbochargers offer the great performance for the street and competition.